Bio: I am indebted to Jeffrey Morseburg, author of the Lukits website, for the following, gleaned directly from the website. Theodore Lukits (1897 - 1992) was a fascinating character and a versatile artist who painted moody plein-air landscapes, dynamic murals and colorful portraits of Hollywood's Golden Age beauties. In his paintings, Lukits successfully reconciled academic draftsmanship with an innovative sense of color. He was a staunch and thoroughly trained traditionalist who mastered the methods and ideals of the French Academie des Beaux-Arts that he learned from the French-trained teachers and then, in turn, passed on to generations of his own students. However, Lukits sought to expand the boundaries of classical painting. He did this through the bold use of intense color in his portraits and his pursuit of the most transient and ephemeral of nature's moods in his landscapes. He was a perfectionist who sought to control every aspect of his artistry. 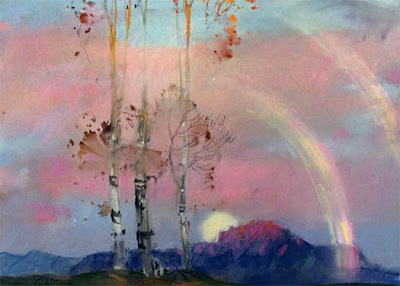 Lukits ground his own paints, crafted his brushes, and created the pastels he relied on out-of-doors. He shaped his own unique palettes, and even carved the frames he exhibited his paintings in. Lukits lived a long life and by its end he was able to witness the painters of his youth regaining the recognition they had lost to the vicissitudes of artistic taste. Thanks to the artists who kept the flame of traditional art alive, those who never abandoned their love of beauty, harmony and craftsmanship, a new era has dawned like one of Theodore Lukits' bold sunrises lighting the horizon. Subjects: Landscape; portraits; figurative; illustration. Navigation: Main links remain visible. The website was created by Jeffrey Morseburg, a student of Lukits, and owner of Morseburg Galleries since 1958. Only the biography link is non-functional. Gallery: There are numerous galleries to enjoy on this site. The pastel gallery alone contains 12 sub-galleries: Sunrise and sunset; Mountain scenes; Cloudscapes; Dream landscapes; High altitude series; Nocturnes; Southern California; Deserts; California Marines; Arizona and New Mexico; Landscapes and Figures; Rainbows. Image View: Each sub-gallery opens on a new page; images will enlarge in a pop-up and can be saved.